The CoFair QRCP86 is a roll of Quick Roof repair tape that is easy to apply and is a strong, permanent application that lasts for years. 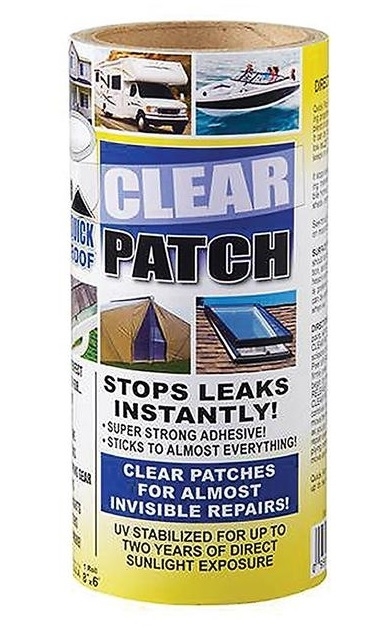 Strong adhesive sticks to just about anything. Simply peel off and press in place. Clear patches for almost invisible repairs. Repairs roofing, gutters, flashings, RVs, marine, mobile homes, trucks, trailers, skylights, camping, gear, and more. UV stabilized for up to two years of direct sunlight exposure. Roll measures 8" wide x 6' long.